Need a healthy meal made in minutes? Try this. Stuffed sweet potatoes are simple and very nutritious easy meal idea that can be prepared ahead of time and enjoyed on the go. Something even the kids can enjoy. With this recipe, you’re getting a combination of protein, complex carbs, and fibrous carbs all in one. Fit Tip: This is a great post- workout meal. 1. Preheat oven at 450. Bake sweet potatoes for 45 minutes (or put in microwave – press potato option – I think the standard time may be 6- 8 minutes depending the size of the sweet potato. 2. Brown sausage in a large skillet. 4. When sweet potatoes are soft, cut in half length wise. (not completely through, just enough to open the potato). 5. In a large baking sheet, place all potatoes. Begin to flatten inside of potato to make room for sautéed mixture. 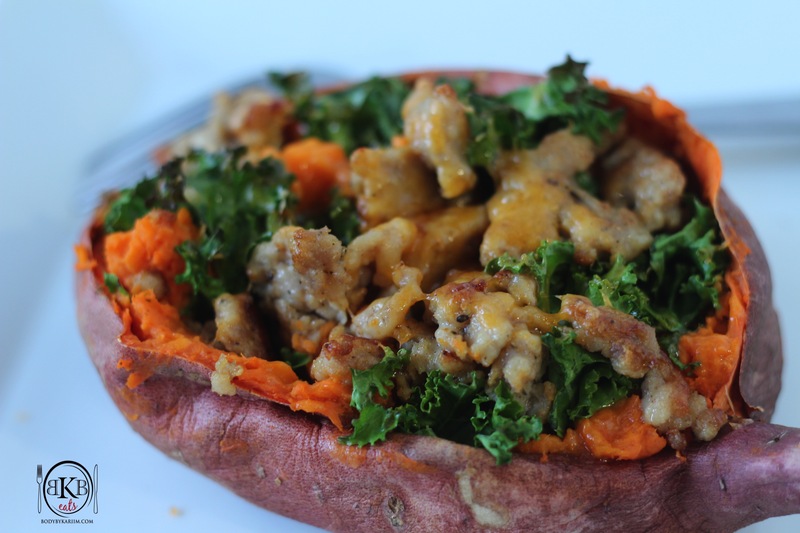 With a spoon, scoop out chicken sausage and kale combo and add to the potatoes. Evenly divide amongst all sweet potatoes. 6. Top each with fresh cheddar. Place in oven for about 10 minutes or until they’re browned/cheese has melted to your liking. 7. Remove from oven, let cool, plate and Enjoy! Oh Yea!!!!!!! A good one.